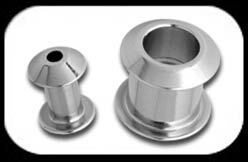 Flesh Tunnel in surgical steel with angle cut flange. 2 piece tunnel, internally threaded. Sizes 3mm-12mm.